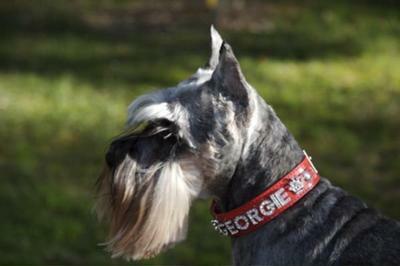 Georgie was my first schnauzer, the one that made me love the breed. She was born Liebestraum's Georgie Girl belonging to Virginia Rice of Florida. A beautiful schnauzer from champion lines, just too small to show. When I met Georgie, she walked from the kennel up to the chair where I was sitting. She lifted one paw and lightly touched my leg. I asked if I could pick her up. Then she sat on my lap for the next hour while I talked about owning a mini schnauzer. She had already claimed me! She was regal, feisty, smart, stubborn, independent, curious and very vocal. Georgie was very driven to put it mildly. Whatever she set her mind to, she could do. Every day she inspected the perimeter of the yard and chased squirrels. Only when her vision dimmed and arthritis slowed her down did she give it up to the younger dogs. We walked every day, even on her very last. She loved exploring and meeting people and other dogs along the way. Georgie went everywhere I could take her. At the same time, I had a younger schnauzer named Annie, from the same mother, different litter. We were inseparable. We moved from Florida back to my home state of California. We drove and stayed at many places along the way. Everywhere they explored, met new people, made new pup friends. What a delight to travel with them. The traveling never stopped. Georgie has friends all over the US, Europe and Asia. No matter where we were, her favorite place to go was the beach. She ran like a pup every time we went no matter her age. She seemed to unleash joy and freedom. Georgie lived with a variety of other dogs and pets ~ other schnauzers, shih tzus, an elderly golden retriever, cats and parrots. She was one of the smallest but was always the alpha of the pack. Her formidable presence kept everyone in line, but she was also a great example to the others. She taught others how to travel and how to chase squirrels, great lessons in our household. We went through thick and thin, joyfulness and sadness, illness and health. I used to hold her in my arms and tell her "Georgie, you are my heart." She would look directly in my eyes and we would connect on a very deep level. That is probably what I miss the most ~ holding her in my arms and connecting on that love level. I know she is with me always, but I will be so glad some day to hold her again and to watch her run on the beach. Georgie, thank you for teaching me about unconditional love and joy. Thank you for keeping me in the moment. Thank you for such sweetness and humor. Thank you for the little soul who still accompanies me - you are my heart and always will be! Georgie was so special and we know they will live in our hearts forever and I am sure you will be reunited with her--she waits for you at Rainbow Bridge, just like my Gus waits for me. So sorry. What a beautiful story.I had to hold back my tears as I read it. It reminded me so much of my mini schnauzer Rio. When you were describing the feeling of your dog looking in your eyes and the 'deeper level' of understanding, it perfectly described my Rio. He was so tuned in to my feelings & emotions. Thank you for sharing your story. A Beautiful Tribute to Georgie. I know exactly how you feel. Our little Schnauzer girl, we feel the way about. Maybe they are running & playing together. I am so happy that you had such a wonderful relationship with Georgie. Nobody could have put those words together about my sweet Georgie Girl except for her mom Nancy. Georgie was one truly beautiful schnauzer and Georgie will remain in our hearts forever. Talk about a schnauzer with unconditional love she had it for you Nancy. How fitting for such a beautiful schnauzer angel! Rest in peace, sweet Georgie! Your tribute is beautiful....It brought tears to my eyes, but joy to my heart. What a beautiful tribute to your precious Georgie Girl we know how much you miss her. You are correct she is always with you. Nancy, your tribute is so beautiful, just like Georgie. You put the words down just right and you make me wanna cry right here at work! What a great dog and what a great relationship you two had. Nancy you captured your relationship with Georgie so beautifully. Thank you for sharing.